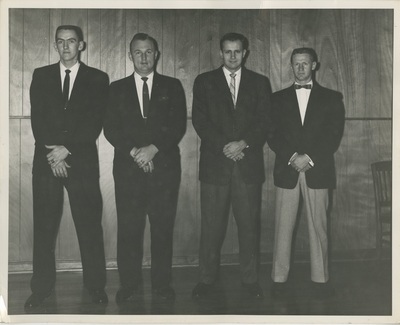 Senior class officers of '59 are standing indoors, posing for a group picture. We encourage fair use of these materials under current U.S. Copyright law and accompanying guidelines. Lincoln Memorial University’s Digital Collections are made available for non-profit and educational use such as research, teaching, and private study. For these purposes, you may reproduce materials without prior permission. However, users must obtain written permission from the University Archivist for other purposes including publication. Where possible, the information provided for these digital resources is given to assist patrons in determining the historical importance and cultural context of an item. In some instances, not all information regarding author, publisher, or other contributing individuals or entities is known. Any user or patron who may have additional information regarding a particular resource is highly encouraged to contact us with the information. Found in the LMU Railsplitter 1959, page 28.